This is a crampon for the entry level alpinist considering the technical needs of users together with the search of simplicity and lightness. Front part made in steel with 6 points. Flex size adjustment bar. Rear part in steel with 4 points. Complete with the pro-active Grivel anti balling system. Offered with new-matic and new classic binding systems. Compact storage and minimum weight for transport. 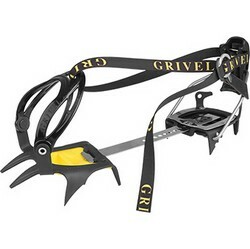 The perfect entry level crampons.